Jo-Wilfried Tsonga won his first ATP Tour title since 2017 with a 6-4 6-2 victory over Pierre-Hugues Herbert at the Open Sud de France. 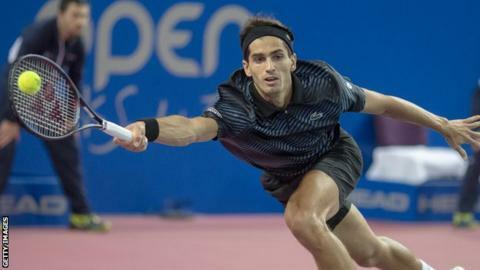 The former world number five saw his 2018 season wrecked by injury but found form in Montpellier, beating Gilles Simon and Jeremy Chardy on his way to the final. The 33-year-old Tsonga was out for seven months last year following a left-knee injury. It is Tsonga's first title since he defeated Diego Schwartzman to win the 2016 Antwerp title without surrendering a set. The pair shared the opening six games before trading three straight breaks of serve, with Medvedev securing two of those, before the Russian served out the first set. That all changed in game nine when Tsonga scored a break with a return victor, moving 5-4 up and closing the opener with a hold at love for a 6-4. Russia's Daniil Medvedev reached the final of the Sofia Open in Bulgaria with a 6-2 6-4 win over Gael Monfils. It was fourth title in 13 months. Tsonga next plays Radu Albot of Macedonia, who won 6-2, 7-6 (2) against qualifier Marcos Baghdatis of Cyprus. Herbert's continued attack proved no match for Tsonga, who drilled backhand returns at his opponent's laces to earn two breaks of serve. He also committed five double faults and saved just four of eight break points, as Medvedev won in 76 minutes.